The IRON SLEEK Hard Court Bracket for medium height boards is the ultimate hard ground bracket for hockey boards. Excellent for synthetic ice or Sport pad tiles, Indoor or Outdoor use. 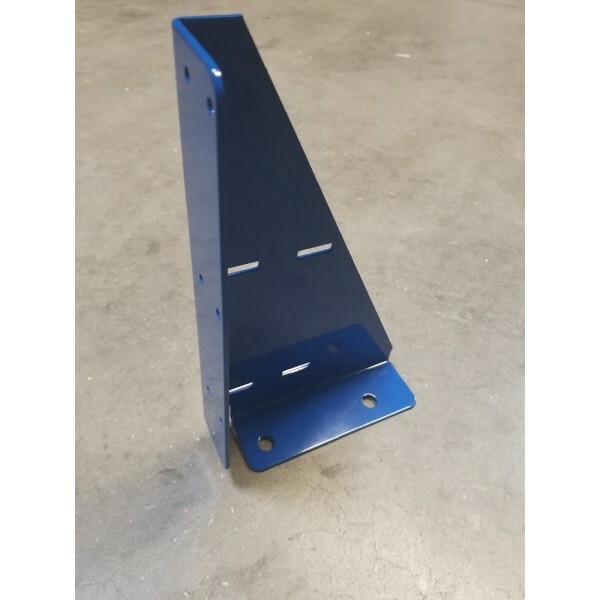 It can be used with our 20" poly steel boards or with custom boards made of lumber up to 24 inches tall. The brackets is 12" inches tall 7" deep and 1/8" thick. Made of 100% steel and has an attractive blue streamlined design which is completely versatile. 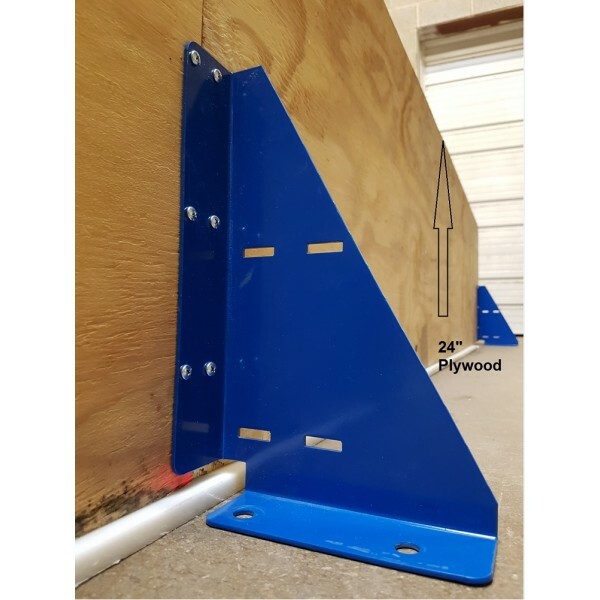 Our brackets are specifically designed with a 1” notched to aid with any expansion and contraction making them a perfect fit for synthetic ice and sports court tiles. The brackets are STEEL so they are still sleek and strong but they are also PRECISE. If you pilot holes or use concrete anchors, the holes will always line up and be interchangeable for easy assembly and disassembly. 1 Iron Sleek Hard Court bracket for 20" tall boards. Kit Includes:	5 mil 25' X 50' Liner	24 Iron Sleek Rink Brackets	4 Iron Sleek Extensions	4 Iron Sleek Corner Brackets1 Patch Tape1 Instructions .. This economy backyard rink liner measures 25' wide and 50' long. It is a 5 mil 3 ply liner that is white on both sides. 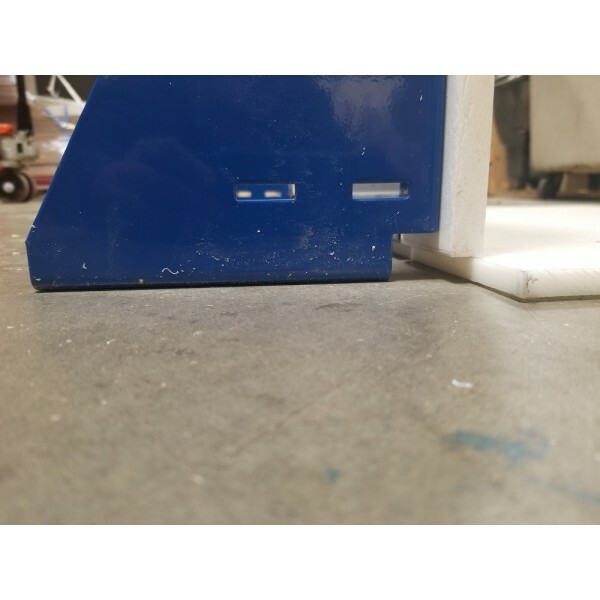 This is a perfe..
40' X 50' Skating Rink Kit	Includes:	32 Iron Sleek Bracket	8 Iron Sleek Corner Brackets	1 45' X 55' Iron Sleek 6mil All-White Liner	This .. Kit Includes:	5 mil 25' X 25' Liner	12 Iron Sleek Rink Brackets	4 Iron Sleek Corner Brackets	All necessary Hardware. This kit does NOT in.. This ice rink liner measures 35' wide and 50' long. It is a 6 mil 3 ply liner that is white on both sides. Impermeable and pin-hole free. .. This ice rink liner measures 35' wide and 75' long. It is a 6 mil 3 ply liner that is white on both sides. This rink liner can.. This ice rink liner measures 45' wide and 55' long. It is a 6 mil 3 ply liner that is white on both sides. This rink liner can.. This ice rink liner measures 45' wide and 75' long. It is a 6 mil 3 ply liner that is white on both sides. This rink liner can.. This ice rink liner measures 45' wide and 95' long. It is a 6 mil 3 ply liner that is white on both sides. This rink liner can.. This economy backyard rink liner measures 25' wide and 25' long. It is a 5 mil 3 ply liner that is white on both sides. 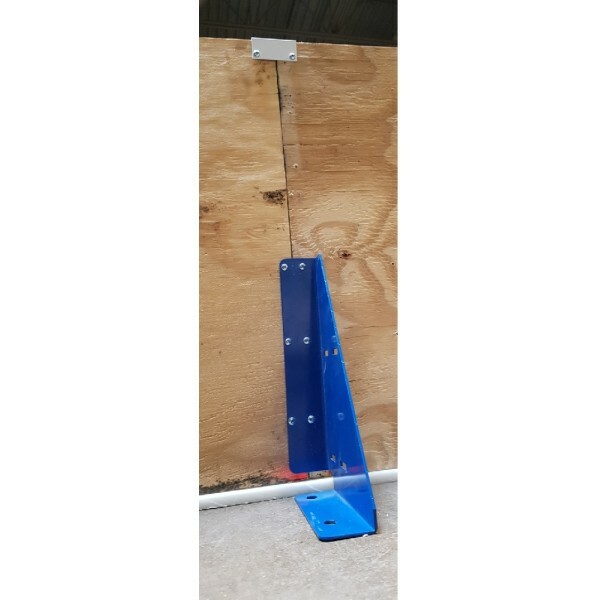 This is a perfe..
30' X 70' Skating Rink Kit	Includes:	36 Iron Sleek Bracket	8 Iron Sleek Corner Brackets	1 35' X 75' Iron Sleek 6mil All-White Liner	This ..
30' X 45' Skating Rink Kit	Includes:	26 Iron Sleek Bracket	8 Iron Sleek Corner Brackets	1 35' X 50' Iron Sleek 6mil All-White Liner	This kit d..
40' X 70' Skating Rink Kit	Includes:	40 Iron Sleek Bracket	8 Iron Sleek Corner Brackets	1 45' X 75' Iron Sleek 6mil All-White Liner	This ..
40' X 90' Skating Rink Kit	Includes:	48 Iron Sleek Bracket	8 Iron Sleek Corner Brackets	1 45' X 95' Iron Sleek 6mil All-White Liner	..
30' X 60' Skating Rink Kit	Includes:	32 Iron Sleek Bracket	8 Iron Sleek Corner Brackets	1 35' X 65' Iron Sleek 6mil All-White Liner	This ..
40' X 60' Skating Rink Kit	Includes:	36 Iron Sleek Bracket	8 Iron Sleek Corner Brackets	1 45' X 65' Iron Sleek 6mil All-White Liner	..
40' X 80' Skating Rink Kit	Includes:	44 Iron Sleek Bracket	8 Iron Sleek Corner Brackets	1 45' X 85' Iron Sleek 6mil All-White Liner	.. This ice rink liner measures 35' wide and 65' long. It is a 6 mil 3 ply liner that is white on both sides. This rink liner can.. This ice rink liner measures 45' wide and 65' long. It is a 6 mil 3 ply liner that is white on both sides. This rink liner can.. This ice rink liner measures 45' wide and 85' long. It is a 6 mil 3 ply liner that is white on both sides. This rink liner can be u.. This ice rink liner measures 35' wide and 55' long. It is a 6 mil 3 ply liner that is white on both sides. 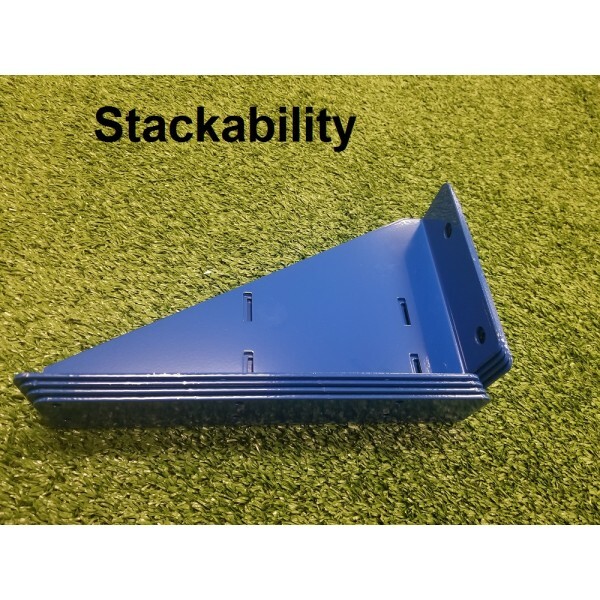 This rink liner can..
30' X 50' Skating Rink Kit	Includes:	28 Iron Sleek Bracket	8 Iron Sleek Corner Brackets	1 35' X 55' Iron Sleek 6mil All-White Liner	This .. This ice rink liner measures 32' wide and 45' long. It is a 6 mil 3 ply liner that is white on both sides. Impermeable and pin-hole free. .. This economy backyard rink liner measures 32' wide and 30' long. It is a 6 mil 3 ply liner that is white on one side and black on the ot.. This economy backyard rink liner measures 35' wide and 24' long. It is a 6 mil 3 ply liner that is white on both sides. The white ..
50' X 80' Skating Rink Kit	Includes:	48 Iron Sleek Brackets	8 Iron Sleek Corner Brackets	1 55' X 85' Iron Sleek 6mil All-White Liner	This.. This ice rink liner measures 55' wide and 85' long. It is a 6 mil 3 ply liner that is white on both sides. This rink liner can.. This ice rink liner measures 55' wide and 75' long. It is a 6 mil 3 ply liner that is white on both sides. This rink liner can.. This ice rink liner measures 55' wide and 65' long. It is a 6 mil 3 ply liner that is white on both sides. This rink liner can.. This ice rink liner measures 65' wide and 135' long. It is a 6 mil 3 ply liner. This product weighs over 150 lbs. and special shipp.. This ice rink liner measures 55' wide and 135' long. It is a 6 mil 3 ply liner that is white on both sides. This product weighs ove.. This ice rink liner measures 55' wide and 105' long. It is a 6 mil 3 ply liner that is white on both sides. 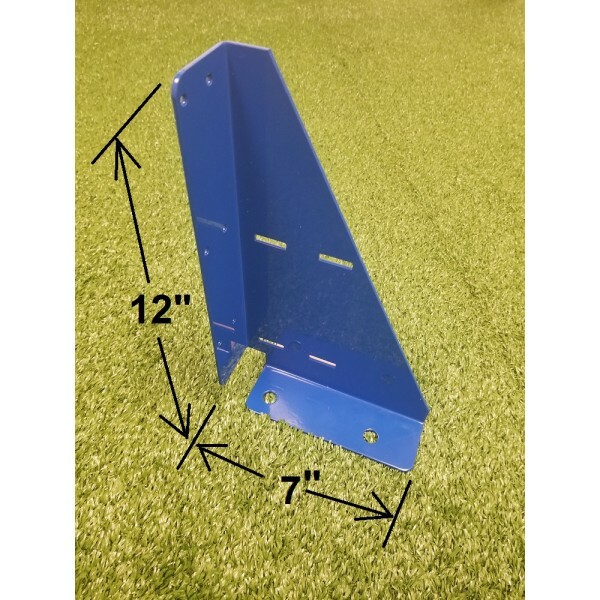 This product weighs ove..
50' X 70' Skating Rink Kit	Includes:	44 Iron Sleek Bracket	8 Iron Sleek Corner Brackets	1 55' X 75' Iron Sleek 6mil All-White Liner	.. This ice rink liner measures 55' wide and 200' long. It is a 6 mil 3 ply liner that is white on both sides. 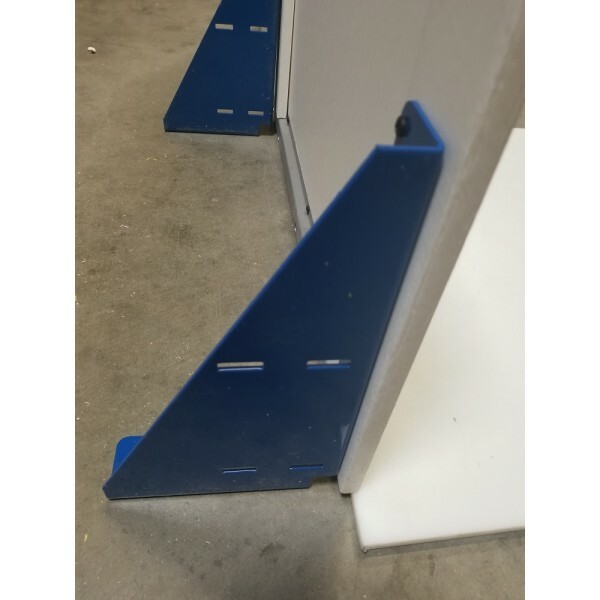 This product weighs ove..
25' X 50' Skating Rink Kit	Includes:	26 Iron Sleek Bracket	8 Iron Sleek Corner Brackets	1 55' X 30' Iron Sleek 6mil All-White Liner	This kit d..
25' X 40' Skating Rink Kit	Includes:	24 Iron Sleek Bracket	8 Iron Sleek Corner Brackets	1 45' X 30' Iron Sleek 6mil All-White Liner	This kit d.. This ice rink liner measures 35' wide and 60' long. It is a 6 mil 3 ply liner that is white on both sides. This rink liner can.. This ice rink liner measures 35' wide and 70' long. It is a 6 mil 3 ply liner that is white on both sides. This rink liner can.. This ice rink liner measures 45' wide and 50' long. It is a 6 mil 3 ply liner that is white on both sides. This rink liner can.. This ice rink liner measures 45' wide and 60' long. It is a 6 mil 3 ply liner that is white on both sides. This rink liner can.. This ice rink liner measures 45' wide and 70' long. It is a 6 mil 3 ply liner that is white on both sides. This rink liner can.. This ice rink liner measures 45' wide and 80' long. It is a 6 mil 3 ply liner that is white on both sides. This rink liner can.. This ice rink liner measures 45' wide and 90' long. It is a 6 mil 3 ply liner that is white on both sides. This rink liner can.. This ice rink liner measures 32' wide and 55' long. It is a 6 mil 3 ply liner that is white on both sides. This rink liner can.. This ice rink liner measures 32' wide and 75' long. It is a 6 mil 3 ply liner that is white on both sides. This rink liner can.. This ice rink liner measures 40' wide and 55' long. It is a 6 mil 3 ply liner that is white on both sides. This rink liner can.. This ice rink liner measures 40' wide and 75' long. It is a 6 mil 3 ply liner that is white on both sides. This rink liner can.. This ice rink liner measures 40' wide and 95' long. It is a 6 mil 3 ply liner that is white on both sides. This rink liner can.. This ice rink liner measures 32' wide and 60' long. It is a 6 mil 3 ply liner that is white on both sides. This rink liner can.. This ice rink liner measures 40' wide and 60' long. It is a 6 mil 3 ply liner that is white on both sides. This rink liner can.. This ice rink liner measures 80' wide and 200' long. It is a 6 mil 3 ply liner. This product weighs over 150 lbs. and special shipp.. This ice rink liner measures 65' wide and 150' long. It is a 6 mil 3 ply liner. This product weighs over 150 lbs. and special shipp.. This ice rink liner measures 80' wide and 150' long. It is a 6 mil 3 ply liner. This product weighs over 150 lbs. and special shipp.. This ice rink liner measures 65' wide and 100' long. It is a 6 mil 3 ply liner. This product weighs over 150 lbs. and special shipp.. This ice rink liner measures 65' wide and 120' long. It is a 6 mil 3 ply liner. This product weighs over 150 lbs. and special shipp.. This ice rink liner measures 80' wide and 175' long. It is a 6 mil 3 ply liner. This product weighs over 150 lbs. and special shipp.. This ice rink liner measures 80' wide and 100' long. It is a 6 mil 3 ply liner. This product weighs over 150 lbs. and special shipp.. This ice rink liner measures 80' wide and 120' long. It is a 6 mil 3 ply liner. This product weighs over 150 lbs. and special shipp.. This ice rink liner measures 80' wide and 135' long. It is a 6 mil 3 ply liner. This product weighs over 150 lbs. and special shipp.. This ice rink liner measures 100' wide and 200' long. It is a 3 ply liner. This product weighs over 150 lbs. and special shipp.. This ice rink liner measures 100' wide and 2175' long. It is a 3 ply liner. This product weighs over 150 lbs. and special ship.. This ice rink liner measures 100' wide and 150' long. It is a 3 ply liner. This product weighs over 150 lbs. and special shipp.. This ice rink liner measures 100' wide and 100' long. It is a 3 ply liner. This product weighs over 150 lbs. and special shipp.. This ice rink liner measures 55' wide and 120' long. It is a 6 mil 3 ply liner that is white on both sides. 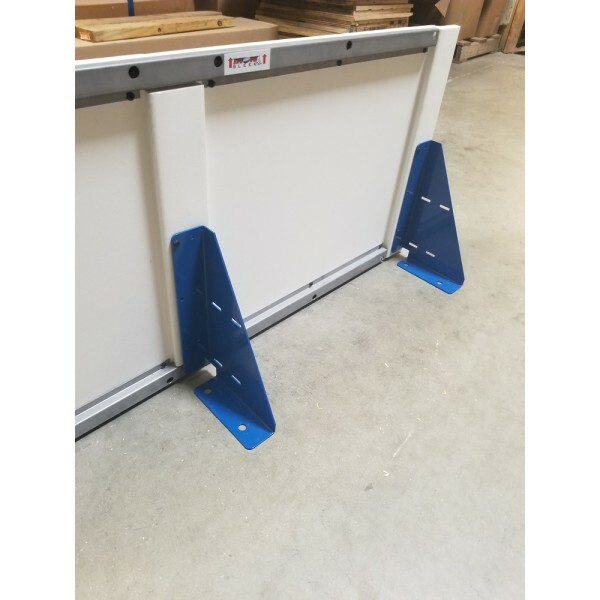 This product weighs ove..
50' X 60' Skating Rink Kit	Includes:	40 Iron Sleek Bracket	8 Iron Sleek Corner Brackets	1 55' X 65' Iron Sleek 6mil All-White Liner	.. This ice rink liner measures 55' wide and 60' long. It is a 6 mil 3 ply liner that is white on both sides. This rink liner can.. This ice rink liner measures 65' wide and 90' long. It is a 6 mil 3 ply liner. This product weighs over 150 lbs. and special shippi.. This ice rink liner measures 100' wide and 210' long. It is a 3 ply liner. This product weighs over 150 lbs. and special shipp.. This ice rink liner measures 60' wide and 100' long. It is a 6 mil 3 ply liner. This product weighs over 150 lbs. and special shipp.. This liner is typically used for recreational curling as it is 100 feet long by 24' 'wide. The white side is practically 100% reflective s.. This ice rink liner measures 40' wide and 65' long. It is a 6 mil 3 ply liner that is white on both sides. This rink liner&nbs.. This ice rink liner measures 50' wide and 80' long. It is a 6 mil 3 ply liner that is white on both sides. This rink liner can.. This ice rink liner measures 32' wide and 50' long. It is a 6 mil 3 ply liner that is white on both sides. This rink liner can.. This ice rink liner measures 32' wide and 65' long. It is a 6 mil 3 ply liner that is white on both sides. This rink liner can.. This ice rink liner measures 32' wide and 70' long. It is a 6 mil 3 ply liner that is white on both sides. This rink liner can.. This ice rink liner measures 50' wide and 65' long. It is a 6 mil 3 ply liner that is white on both sides. This rink liner can.. This ice rink liner measures 50' wide and 85' long. It is a 6 mil 3 ply liner that is white on both sides. This rink liner can.. This ice rink liner measures 40' wide and 80' long. It is a 6 mil 3 ply liner that is white on both sides. This rink liner can.. This ice rink liner measures 65' wide and 135' long. It is a 5 mil 3 ply liner. This product weighs over 150 lbs. and special .. This ice rink liner measures 100' wide and 125' long. It is a 3 ply liner. This product weighs over 150 lbs. and special shipp.. This ice rink liner measures 35' wide and 85' long. It is a 6 mil 3 ply liner that is white on both sides. This rink liner can.. This ice rink liner measures 35' wide and 100' long. It is a 6 mil 3 ply liner that is white on both sides. This rink liner ca.. This ice rink liner measures 35' wide and 80' long. It is a 6 mil 3 ply liner that is white on both sides. This rink liner can.. This ice rink liner measures 35' wide and 90' long. It is a 6 mil 3 ply liner that is white on both sides. This rink liner can.. This ice rink liner measures 35' wide and 95' long. It is a 6 mil 3 ply liner that is white on both sides. This rink liner can.. This ice rink liner measures 32' wide and 90' long. It is a 6 mil 3 ply liner that is white on both sides. This rink liner can.. This ice rink liner measures 32' wide and 95' long. It is a 6 mil 3 ply liner that is white on both sides. This rink liner can.. This ice rink liner measures 32' wide and 100' long. It is a 6 mil 3 ply liner that is white on both sides. This rink liner ca.. This ice rink liner measures 40' wide and 85' long. It is a 6 mil 3 ply liner that is white on both sides. This rink liner can be u.. This ice rink liner measures 40' wide and 100' long. It is a 6 mil 3 ply liner that is white on both sides. This rink liner ca.. This ice rink liner measures 40' wide and 70' long. It is a 6 mil 3 ply liner that is white on both sides. This rink liner&nbs.. This ice rink liner measures 50' wide and 70' long. It is a 6 mil 3 ply liner that is white on both sides. This rink liner can.. This ice rink liner measures 50' wide and 75' long. It is a 6 mil 3 ply liner that is white on both sides. 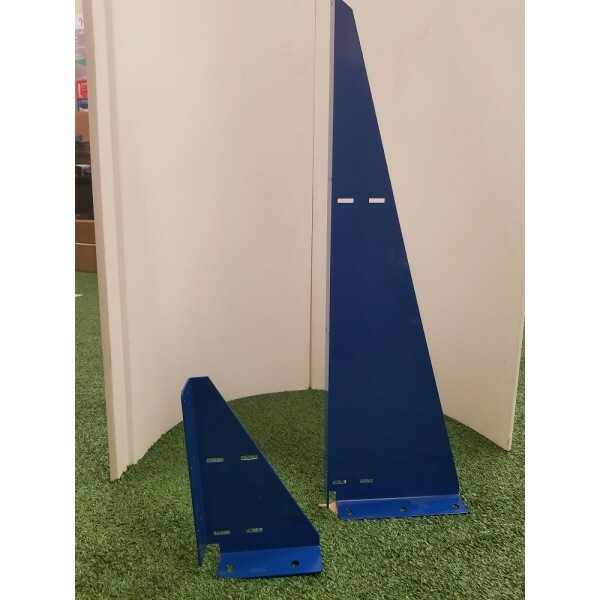 This rink liner can..
35' X 55' Skating Rink Kit	Includes:	32 Iron Sleek Bracket	8 Iron Sleek Corner Brackets	1 40' X 60' Iron Sleek 6mil All-White Liner	This ..
35' X 75' Skating Rink Kit	Includes:	40 Iron Sleek Bracket	8 Iron Sleek Corner Brackets	1 40' X 80' Iron Sleek 6mil All-White Liner	This ..
35' X 95' Skating Rink Kit	Includes:	48 Iron Sleek Bracket	8 Iron Sleek Corner Brackets	1 40' X 100' Iron Sleek 6mil All-White Liner..
30' X 80' Skating Rink Kit	Includes:40 Iron Sleek Bracket	8 Iron Sleek Corner Brackets	1 35' X 85' Iron Sleek 6mil All-White Liner	This k.. This ice rink liner measures 56' wide and 100' long. It is a 6 mil 3 ply liner. This product weighs over 150 lbs. and special shipp.. This ice rink liner measures 56' wide and 150' long. It is a 6 mil 3 ply liner. This product weighs over 150 lbs. and special shipp.. Kit Includes: 5 mil 25' X 35' Liner 16 Iron Sleek Rink Brackets 4 Iron Sleek Corner Brackets All necessary Hardware. This kit.. 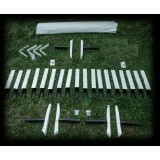 Kit Includes:	5 mil 30' X 35' Liner	18 Iron Sleek Rink Brackets	4 Iron Sleek Corner Brackets	All necessary Hardware. This kit does NOT in.. This ice rink liner measures 50' wide and 90' long. It is a 6 mil 3 ply liner. 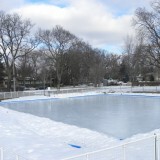 This rink liner can be used for rinks up to 45'.. 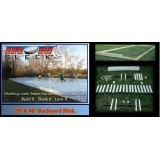 This economy backyard rink liner measures 25' wide and 40' long. It is a 5 mil 3 ply liner that is white on both sides. This is a perfe.. This ice rink liner measures 28' wide and 50' long. It is a 6 mil 3 ply liner that is white on both sides. This rink liner can.. This ice rink liner measures 28' wide and 60' long. It is a 6 mil 3 ply liner that is white on both sides. This rink liner can.. This ice rink liner measures 28' wide and 70' long. It is a 6 mil 3 ply liner that is white on both sides. This rink liner can.. This ice rink liner measures 30' wide and 50' long. It is a 6 mil 3 ply liner that is white on both sides. This rink liner can.. This ice rink liner measures 30' wide and 60' long. It is a 6 mil 3 ply liner that is white on both sides. This rink liner can.. This ice rink liner measures 30' wide and 70' long. It is a 6 mil 3 ply liner that is white on both sides. This rink liner can.. This ice rink liner measures 60' wide and 120' long. It is a 6 mil 3 ply liner. This product weighs over 150 lbs. and special shipp.. This liner is typically used for recreational curling as it is 150 feet long by 24' 'wide. The white side is practically 100% reflective s.. This ice rink liner measures 50' wide and 60' long. It is a 6 mil 3 ply liner that is white on both sides. This rink liner can.. This ice rink liner measures 50' wide and 100' long. It is a 6 mil 3 ply liner. 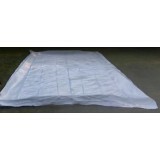 This rink liner can be used for rinks up to 45.. This ice rink liner measures 50' wide and 120' long. It is a 6 mil 3 ply liner. 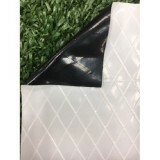 This rink liner can be used for rinks up to 45.. This ice rink liner measures 50' wide and 150' long. It is a 6 mil 3 ply liner. This rink liner can be used for rinks up to 45.. This ice rink liner measures 50' wide and 175' long. It is a 6 mil 3 ply liner. This rink liner can be used for rinks up to 45.. This ice rink liner measures 55' wide and 150' long. It is a 6 mil 3 ply liner that is white on both sides. This product weighs ove.. This ice rink liner measures 60' wide and 80' long. It is a 6 mil 3 ply liner. This rink liner can be used for rinks up to 55'.. This ice rink liner measures 60' wide and 130' long. It is a 6 mil 3 ply liner. This product weighs over 150 lbs. and special shipp.. This ice rink liner measures 60' wide and 150' long. It is a 6 mil 3 ply liner. This product weighs over 150 lbs. and special shipp.. This ice rink liner measures 60' wide and 175' long. It is a 6 mil 3 ply liner. This product weighs over 150 lbs. and special shipp.. This ice rink liner measures 60' wide and 200' long. It is a 6 mil 3 ply liner. This product weighs over 150 lbs. and special shipp.. This ice rink liner measures 80' wide and 110' long. It is a 6 mil 3 ply liner. This product weighs over 150 lbs. and special shipp.. This ice rink liner measures 80' wide and 160' long. It is a 6 mil 3 ply liner. This product weighs over 150 lbs. and special shipp.. This ice rink liner measures 100' wide and 110' long. It is a 3 ply liner. This product weighs over 150 lbs. and special shipp.. This ice rink liner measures 100' wide and 160' long. It is a 3 ply liner. This product weighs over 150 lbs. and special shipp.. This ice rink liner measures 120' wide and 125' long. It is a 3 ply liner. This product weighs over 150 lbs. and special shipp.. This ice rink liner measures 120' wide and 150' long. It is a 3 ply liner. This product weighs over 150 lbs. and special shipp.. This ice rink liner measures 120' wide and 180' long. It is a 3 ply liner. This product weighs over 150 lbs. and special shipp.. This ice rink liner measures 120' wide and 200' long. It is a 3 ply liner. This product weighs over 150 lbs. and special shipp..
35' X 65' Skating Rink Kit	Includes:	36 Iron Sleek Bracket	8 Iron Sleek Corner Brackets	1 40' X 70' Iron Sleek 6mil All-White Liner	This ..
35' X 85' Skating Rink Kit	Includes:	44 Iron Sleek Bracket	8 Iron Sleek Corner Brackets	1 40' X 90' Iron Sleek 6mil All-White Liner	This ..
45' X 55' Skating Rink Kit Includes: 36 Iron Sleek Bracket 8 Iron Sleek Corner Brackets 1 50' X 60' Iron .. This ice rink liner measures 60' wide and 150' long. It is a 6 mil 4 ply string reinforced liner. This product weighs over 150 lbs. .. This ice rink liner measures 60' wide and 200' long. It is a 6 mil 4 ply string reinforced liner. This product weighs over 150 lbs. .. This ice rink liner measures 84' wide and 150' long. It is a 6 mil 4 ply string reinforced liner. This product weighs over 150 lbs. .. This ice rink liner measures 84' wide and 200' long. It is a 6 mil 4 ply string reinforced liner. This product weighs over 150 lbs. .. This ice rink liner measures 55' wide and 80' long. It is a 6 mil 3 ply liner that is white on both sides. This rink liner can be us.. This ice rink liner measures 30' wide and 55' long. It is a 6 mil 3 ply liner that is white on both sides. This rink liner can.. This ice rink liner measures 65' wide and 65' long. It is a 6 mil 3 ply liner. This rink liner can be used for rinks up to 60'.. This ice rink liner measures 60' wide and 60' long. It is a 6 mil 3 ply liner. This rink liner can be used for rinks up to 55'.. This ice rink liner measures 50' wide and 110' long. It is a 6 mil 3 ply liner. This rink liner can be used for rinks up to 45.. This ice rink liner measures 60' wide and 90' long. It is a 6 mil 3 ply liner. This product weighs over 150 lbs. and special shippi.. This economy backyard rink liner measures 25' wide and 60' long. It is a 5 mil 3 ply liner that is white on both sides. This is a perfe.. This economy backyard rink liner measures 25' wide and 70' long. It is a 5 mil 3 ply liner that is white on both sides. This is a perfe.. This economy backyard rink liner measures 25' wide and 80' long. It is a 5 mil 3 ply liner that is white on both sides. This is a perfe.. This ice rink liner measures 80' wide and 170' long. It is a 6 mil 3 ply liner. This product weighs over 150 lbs. and special shipp.. This economy backyard rink liner measures 25' wide and 30' long. It is a 5 mil 3 ply liner that is white on both sides. This is a perfe.. This economy backyard rink liner measures 25' wide and 35' long. It is a 5 mil 3 ply liner that is white on both sides. This is a perfe.. This ice rink liner measures 54' wide and can be from 135' - 200' long. It is a 6 mil 4 ply string reinforced liner. This product we.. This ice rink liner measures 60' wide and can be from 125' - 200' long. It is a 6 mil 4 ply string reinforced liner. This product we.. This ice rink liner measures 66' wide and can be from 110' - 200' long. It is a 6 mil 4 ply string reinforced liner. This product we.. This ice rink liner measures 72' wide and can be from 105' - 200' long. It is a 6 mil 4 ply string reinforced liner. This product we.. This ice rink liner measures 78' wide and can be from 95' - 200' long. It is a 6 mil 4 ply string reinforced liner. This product wei.. This ice rink liner measures 85' wide and can be from 90' - 200' long. It is a 6 mil 4 ply string reinforced liner. This product wei.. This ice rink liner measures 92' wide and can be from 80' - 200' long. It is a 6 mil 4 ply string reinforced liner. This product wei.. This ice rink liner measures 80' wide and 80' long. It is a 6 mil 3 ply liner. This product weighs over 150 lbs. and special shippi..
Powered By Iron Sleek, Inc.